Growth in Oregon’s jobs, household income levels and tax revenues has accelerated in recent months in line with the baseline forecast. Going forward, the outlook calls for growth to stabilize around current rates for the remainder of the 2013-2015 budget period. Given Oregon’s history of relatively strong economic recoveries, this outlook may prove to be overly pessimistic. Even though they are not discussed as frequently, upside risks to the outlook are now as prevalent as are darker scenarios. Despite ebbs and flows, the nationwide economic recovery remains on track. Job growth is just strong enough to bring the unemployment rate down slowly. Wage gains are keeping up with the rate of inflation, although just barely. Also, economic output (Gross Domestic Product) and worker productivity are advancing at a positive, yet sluggish, pace. Given obvious weights on the economy, chiefly housing and government, many economists and forecasters have been calling for the pace of growth to pick up over the next year or so as these weights begin to lessen. Unfortunately, many analysts have been saying this will occur over the next year for each of the past three years. Is this time really different? Could stronger growth in 2014 and 2015 lie just around the corner? It is difficult to pick winners and pinpoint a particular sector or industry that will strengthen and lead to stronger growth overall. However, it is possible that the answer for stronger growth lies not in any particular sector per se, but in geography, with more regions of the country sharing in the recovery. 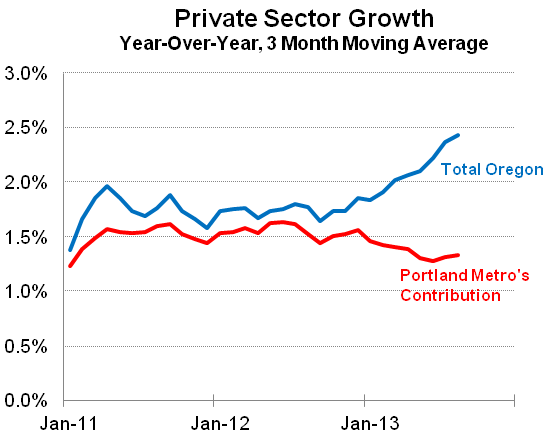 Here in Oregon, the pace of job growth has picked up in 2013 even as the Portland region’s growth has held steady. Notably, the state’s two hardest hit housing metros – Bend and Medford – have begun adding jobs again. Can Oregon’s growth strengthen further as the recovery becomes more broadly based across the other regions of the state? Is this pattern replicable across the country? Since 2011, the Northeast and Midwest regions have added jobs at rates comparable to or stronger than those at the peak of the housing boom – 2005 and 2006. Most western states, except California and Colorado, are still experiencing subdued rates of growth as is the South (due to Florida). As the housing market continues to rebound, along with the ancillary economic activity, expectations are for job growth in western cities and counties to pick up, much like it has in Oregon. If the other regions of the country can maintain their current pace of employment gains while the West improves, then overall growth in the country will accelerate. 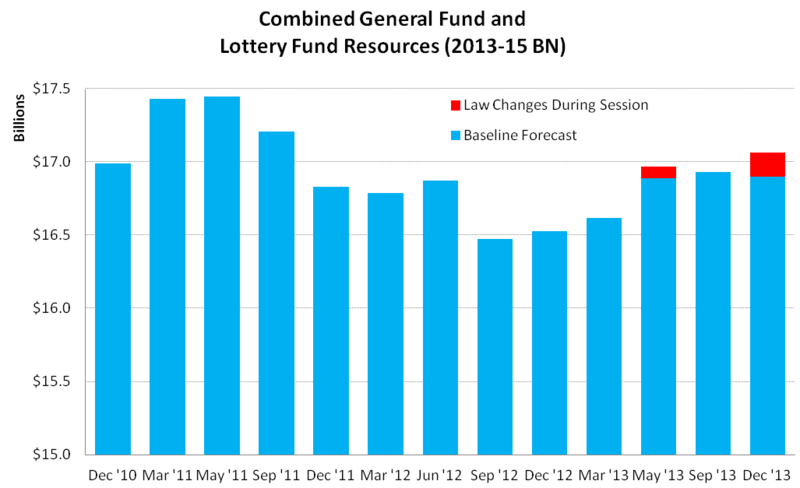 In keeping with a stable economic outlook, expectations for General Fund revenue growth have remained largely unchanged since the September 2013 forecast, aside from the impact of tax reforms enacted during the October 2013 special legislative session. Along with underlying job growth, personal income taxes withheld out of paychecks have accelerated somewhat during the early months of the biennium. Although growth in tax withholdings remains middling from an historical perspective, growth rates have doubled relative to those seen during fiscal year 2013. Although the revenue outlook remains on track, the 2013-15 biennium is still young, and therefore significant uncertainty remains. With 2012 personal income tax returns from filers who requested extensions (a group that includes many of Oregon’s wealthiest households) having been processed this fall, the first large hurdle for the revenue outlook has been cleared. Nevertheless, two income tax filing seasons remain between now and the end of the biennium. As such, many risks to the outlook remain. On the upside, if asset markets maintain their recent gains or if Oregon’s traditionally strong migration trends and labor force growth reappear, a short-term revenue boom remains possible during the 2013-15 budget period.